Manufacturer & Exporter of Metal Enclosures. Our product range also comprises of Sheet Metal Parts and Metal Hinges. 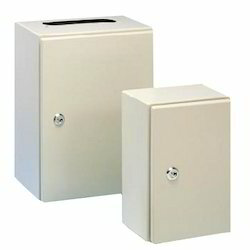 We are offering to our valuable customers a wide range of Metal Enclosures. Our range of sheet metal enclosures are manufactured using superior quality material that offer a matchless quality and high level of durability and highly resistant to corrosion and have high tensile strength. These enclosures are widely demanded by our clients owing to their sturdy construction, corrosion resistance and better durability standards.